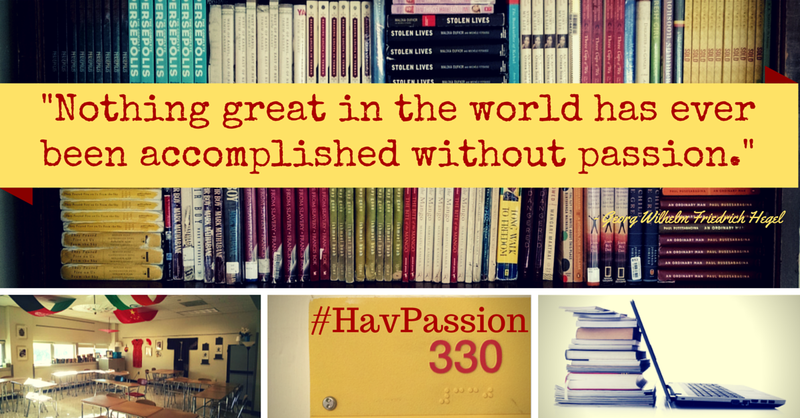 I have been waiting for this week since the start of our school year - the start of our #HavPassion projects. Last fall my students and I completed our first 20% time projects. While my students researched the most effective ways of addressing the homeless problem in our area and learned how to quilt, I completed my own research on the teaching of research writing. In the process of my researching and presenting, I connected with so many educators interested in how passion-based inquiry changes our learning communities. It is a growing community, a community of teachers excited about sharing how voice and choice impact student learning. It was at July's Chromebooks and the Common Core conference that I met Chris Aviles. Following my presentation on Empowering Writers through passion-based inquiry, Chris shared how he and his students are creating and collaborating in a similar way through his Be About It project. Since that first meeting, I've had opportunities to hear Chris present on his 20% time inquiry research project, and specifically, how he renamed it for his unique group of learners, branding his passion-based project to meet the needs of his students. The combination of meeting Angela Maiers in June and talking with Chris in July inspired our own name change. And so #HavPassion was born. You have this page. 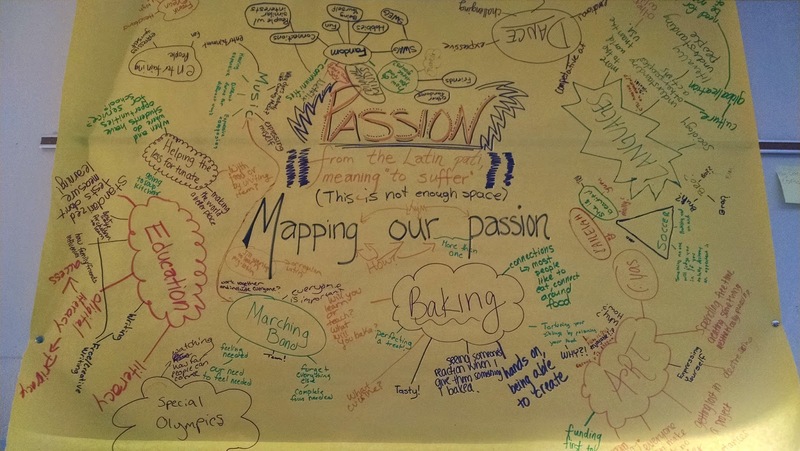 Use it to depict your understanding of “passion.” Consider researching the definition and etymology of passion. Reflect on the ideas and issues that you are passionate about. You have 8 ½ x 11 inches to share your passion. How will you do it? Try Canva or PiktoChart to create a stunning visual. Use Tagxedo to craft an image using words. Take a picture of your passion and use Aviary or Pixlr to alter your image. 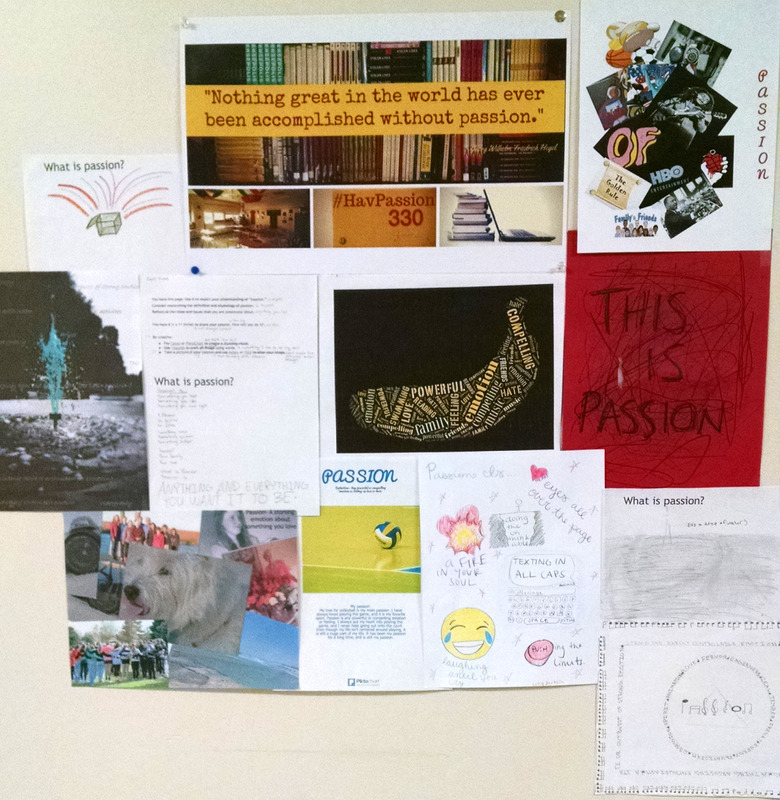 The next day in class, we shared our representations of passion and discussed our definitions. 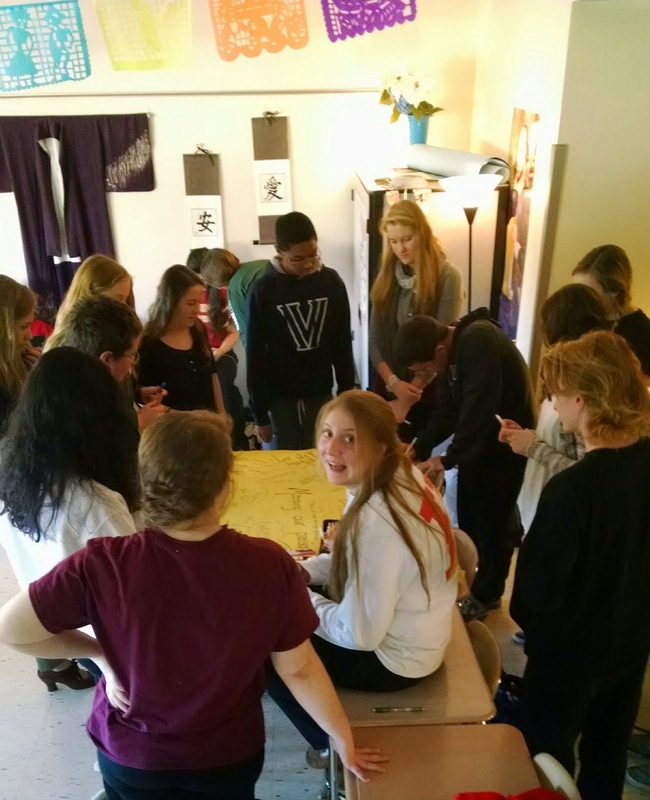 A number of students discovered that the etymological roots of passion lie in suffering. The Latin root of passion, pati, means to suffer, to endure. What is it that you are willing to suffer for? We used this question to help us map our passions. In a similar way that Angela Maiers has students map their heartbreak, I asked my students to create a visual map of our passion. We started with the big categories: what are the issues and ideas that we are most passionate about? I got us started by adding "education" to our map. Students added art, baking, music, languages, and helping others as our initial categories. Then, I directed students to help each other think through the issues and concerns that stem from these categories. I added literacy and digital literacy as off shoots from the larger category of education. Then from digital literacy, I added access as a concern. And that's all it took. Students jumped up to surround our map, adding connections and concerns to their initial categories, helping their peers think through different perspectives on our initial categories. More categories lead to more concerns. After five minutes, I stopped students and directed them to only contribute to the growing map in the form of questions in order to push our thinking further. Questions, connections, and collaboration helped us to think through potential inquiry topics. "Passion may get you going. It may have you fired up about a new project or opportunity. It may lead you to shout it from the mountain tops. But purpose is a different animal. It keeps you going when others fade away. It drives your everyday actions because there is a reason behind everything you do" (60). 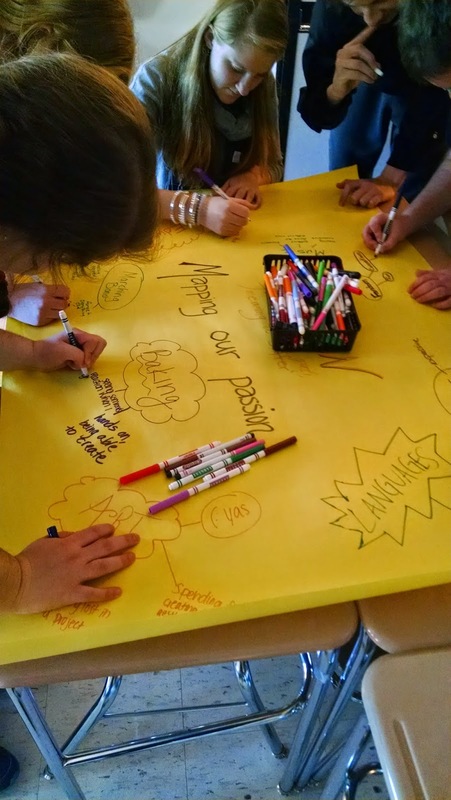 In the coming week, students will continue to brainstorm and explore. As they do, we will be using collaborative tools like Google Docs and Hangouts to connect with Christy Brennan's fifth grade students who are undertaking a very similar learning adventure. I'll be asking my high school students to not only find mentors for their own learning but also become mentors to younger learners. And along the way, all of us will be blogging our adventures in learning. So, stay tuned! Our adventure is just beginning. Wow! What a great way to make it happen and make it meaningful and manageable . Thanks for sharing!